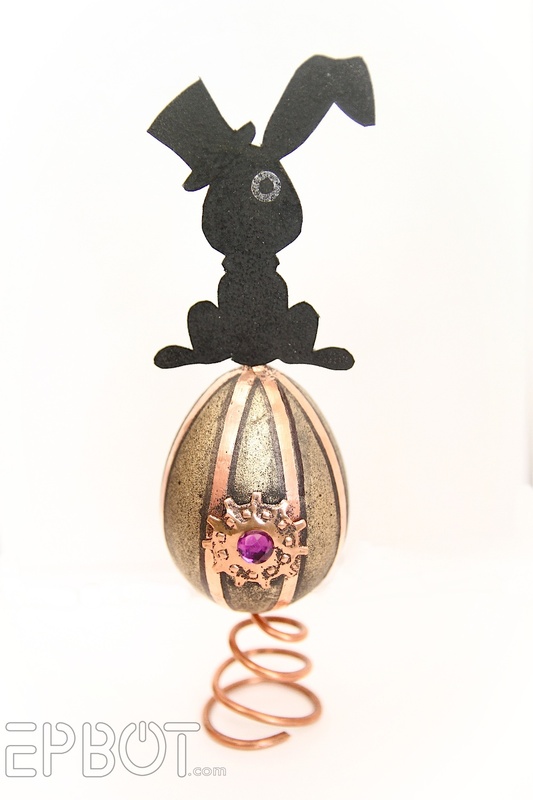 I know I just showed you guys my own steampunk Easter eggs, but now I get to show you what John made! He made the stand by coiling thick copper wire and then threading it through the egg. The wire sticks out the top, and supports that paper bunny silhouette - which John also made by piecing together some clipart. The stripes are copper foil tape, and it's finished off with a foil gear and a plastic rhinestone. Happy Easter, everybody. Hope you're having a fabulous, crafty, and/or candy-filled day! Your combined crafty powers continue to awe me. 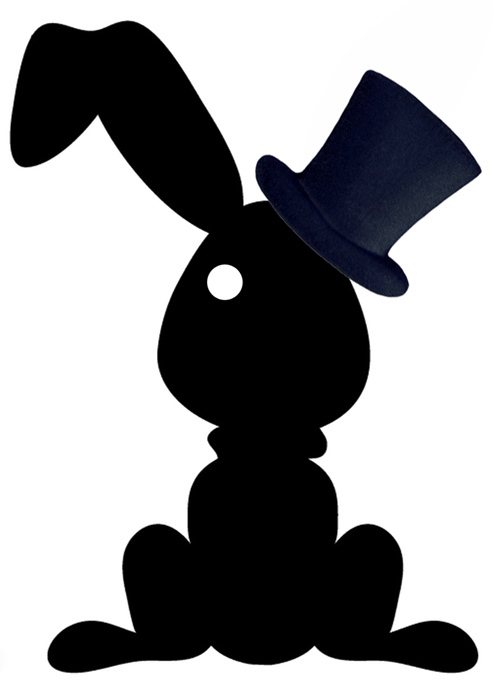 I love the Jen eggs, but the dapper bunny gives me the chills, alas. It looks like it escaped from A Clockwork Orange. If ever there were an Easter Egg likely to commit ultra-violence, it's that one. The thought of a whole army of them of differing heights is frankly terrifying! Beautiful, but terrifying. This is worse than the creepy dolls. But please continue to share, because EPBOT is my favourite site, and your energy and imagination are an inspiration. Happy post-Easter! How fun. 10 points for John! That's an awesome steampunked egg, John! Love the coiled copper display. That would also be a great way to display just a rabbit cut-out because it would look springy...like the bunny was hopping. Ooooooo...ideas for next year! Thank you both for always being so inspirational. How have the kitties not made off with this yet? I'd think the combo of springable spring and roll-able egg (plus shiny!) would make it irresistible. But perhaps they respect the craftsmanship and work that went into it (after all, I'm sure they were supervising the entire time). Very nice, and clever! Well done young man.